View of a bee-keeping class posed outside on the grass. 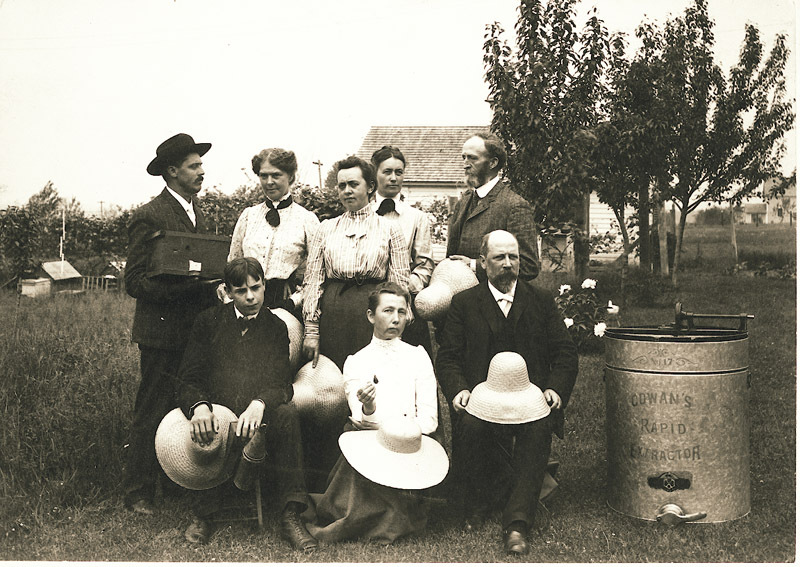 There are fruit trees in the background and a large container marked "Cowan's Rapid Extractor" next to the group. Cowan's Rapid Extractor is a device invented in England in 1875 for the quick extraction of honey. Written on verso: "The man on the extreme left standing is the class instructor - his name is James Fitts Wood. Young man at the left seated and the two women neither Mrs. Paige nor Mrs. Gates can identify. There is Prof. Brooks and the stout man is Mr. French. Sunset Avenue." Lovell, John L., 1825-1903, “Bee-keeping instruction,” Digital Amherst, accessed April 23, 2019, http://www.digitalamherst.org/items/show/553.